^ Facts & Figures Archived May 19, 2006, at the Wayback Machine. ^ NFL gives 32 compensatory draft choices. March 29, 2004. URL Accessed June 24, 2006. ^ Goldberg, Dave. "NFL draft scripted nicely by Manning". NBC Sports via AP. Archived from the original on October 11, 2012. Retrieved April 8, 2011. ^ #4: New York Giants → San Diego (D). see #1: San Diego → New York Giants. above. ^ a b c d e f g h i j k l m n "Round 1". ESPN. Retrieved June 7, 2008. ^ The Bills received this pick from the Dallas Cowboys in exchange for the Bills' second round pick (43rd overall), fifth round pick (144th overall), and first round pick in 2005. ^ a b c d e f g h i j k l m n "Round 2". ESPN. Retrieved June 7, 2008. ^ The Cowboys received this pick from the Buffalo Bills as well as the Bills' fifth round pick (144th overall) and first round pick in 2005 in exchange for the Cowboys' first round pick in this draft (22nd overall). ^ Alder, James. "2004 NFL Draft Results: Round 2". About.com. Retrieved April 7, 2011. ^ #65: New York Giants → San Diego (D). see #1: San Diego → New York Giants. above. ^ a b c d e f g h i j k "Round 3". ESPN. Retrieved June 7, 2008. ^ a b c d e f g h i j k l m n o "Round 4". Retrieved June 7, 2008. ^ a b c d e f g h i "Round 5". ESPN. Retrieved June 7, 2008. 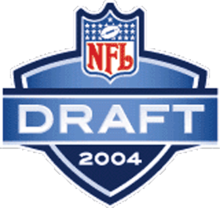 ^ The Cowboys received this pick from the Buffalo Bills as well as the Bills' second round pick (43rd overall) and first round pick in 2005 in exchange for the Cowboys' first round pick in this draft (22nd overall). ^ a b c d e Alder, James. "2004 NFL Draft Results: Round 5". About.com. Retrieved April 8, 2011. ^ a b Alder, James. "2004 NFL Draft Results: Round 6". About.com. Retrieved April 8, 2011. ^ a b c d e f g h i j k "Round 6". ESPN. Retrieved June 7, 2008. ^ a b c d e f g h i j k Alder, James. "2004 NFL Draft Results: Round 7". About.com. Retrieved April 8, 2011.